A standout at St Michael’s College during his two seasons with the notable school in the mid-1940s, Tod Sloan would net an impressive 37 points in 19 games during his rookie campaign of 1944-45, doubling that total as a sophomore when he amassed an impressive 75 points in just 25 games in 1945-46. Sloan would also help the school to their 1945 Memorial Cup championship. Originating from the Sloan family, we have a small group of St. Michael’s memorabilia, including personalized 1945 Memorial Cup and 1944-45 and 1945-46 OHA Junior “A” Champions medals (3), 1945-46 Albert Red Tilson Memorial Trophy tray, 1944-45 St. Michael's Majors watch (damaged), 1944-45 St. Michael's Majors framed team picture, 1945 (1944-45) OHA junior champions patch and a copy of St Michael’s 1945 yearbook, The Thurible. An LOA from the Sloan family will accompany. The Albert Red Tilson tray presented to Sloan is awarded annually by the Ontario Hockey League to the most outstanding player (MVP) as voted by OHL writers and broadcasters. It was donated by The Globe and Mail, and first awarded in 1944–45. At 9”, “Albert Red Tilson Memorial Trophy” along with “1946” and “Tod Sloan” is engraved, with “Birks Sterling” over the reverse along with “42/16” and a trio of hallmarks. A Birks cloth bag will accompany the trophy. The Memorial Cup medal has “CAHA” over the front in white enamel, while the OHA medals both have Ontario flags. 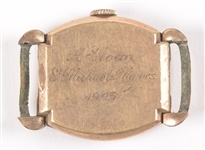 Each medal also has “Tod Sloan” engraved along with the year, with “Trophy Craft gold filled” stamped into the bottom of each. 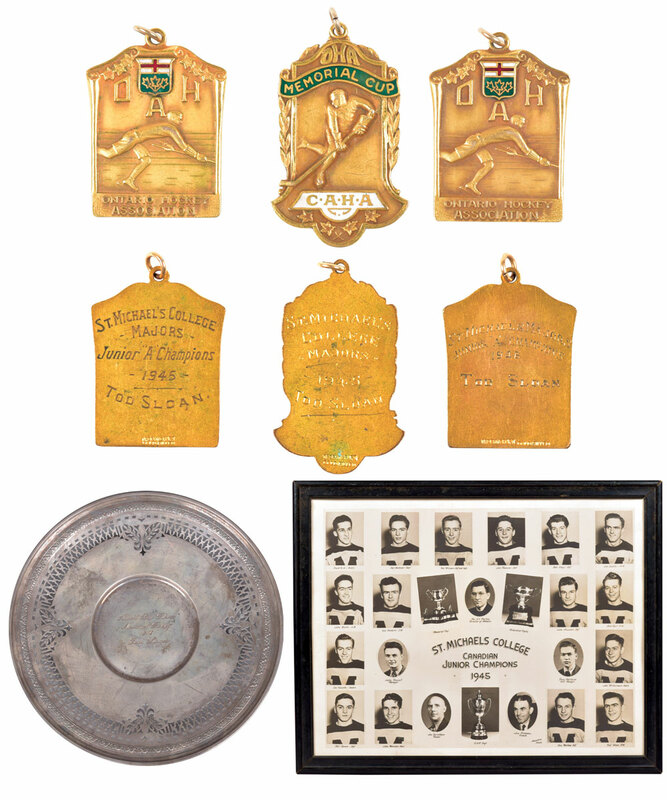 The Memorial Cup and 1945 OHA medal both show wear over the reverse. Next, the Longines watch shows heavy wear with no wrist strap present, with “A Sloan – St. Michael’s Majors – 1945” engraved over the reverse. 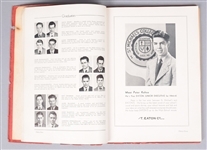 The yearbook exhibits heavy wear with the front and back covers damaged, with Sloan appearing with the Majors on page 102, while the 1945 team photo (10 ½” x 14”) shows heavy toning, set in a cheap 12” x 15” period frame with no glass.